On Friday Lisa and I moved to Pohang, on South Korea's SE coast. We left the training site that morning with the rest of the Gyeongbuk EPIK group, and headed to Gumi (Kumi), where we had an amazing seafood/sushi/sashimi buffet lunch, all paid for by our POE (Provincial Office of Education). It must have cost them over a grand for all of us. We met up with our co-teachers at a high school in Gumi. They were all waiting for us with name placards, milling around in the parking lot nervously. It was really cute. Lisa's and my co-teachers were standing right beside each other, and we bowed and shook hands and introduced ourselves. We got our luggage off of the truck and into their cars, and after a short meeting in the school gym, we took off for Pohang. We drove with Soon Yung, my co-teacher, who speaks great English and has been teaching for 20+ years. I heard enough stories about how your co-teacher can make or break your experience in Korea to know that I lucked out. Two of Lisa's co-teachers came to meet her, and both were really cool. They have all been really helpful so far. ...and that is it! You've officially had the grand tour. Soon Yung asked us if it was OK. I thanked her for all of her hard work in locating a suitable apartment and followed that up with "um...not really." This place would be AWESOME for just one person but with two of us it a bit too much (or too little) to handle for a year. She is working on finding us a bigger place now, but since they have apparently paid the first month's rent, we're going to be here for a little while anyway. It's been pretty tough already, with us splitting the small wardrobe and watching cockroaches scurry around our piles of stuff scattered around the floor. To further complicate matters, some guys showed up yesterday with a giant fridge. Since there is clearly no room for anything in the kitchen, they put it in a corner in our bedroom/living/dining room. Friday night we went out to dinner with Soon Yung, another teacher from my school, and my principal and vice principal. I was a bit nervous, having been prepped on the importance of my first meeting with my kyojang son sang nim (principal), who always demands the highest respect, but it all went really well and we had a great time. Luckily I remembered how to toast him, and everyone got a kick out of that. It also helped to have Lisa on my arm - everyone kept saying how beautiful she was, which really took the pressure off of me to do anything impressive. It was a great meal, served in traditional Korean style, which generally means we had enough food to feed three people for each one at the table. Course after course of raw fish, spicy peppers and sauces, kimchi, rice, soju... Lisa and I were really wondering if they would ever stop bringing us food. That's Soon Yung on the right. It's really hard to smile after an hour and a half of sitting cross-legged, I'll tell you what. On Saturday morning I met with Soon Yung at my school, Idong High School, which is about two minutes' walk from our front door. She wanted to show me the transportation options for Lisa, whose schools (she'll be splitting her time between two) are not nearly as conveniently located as mine. Although Dongji High School (her M-W, an all boys school) is only about a mile away as the crow flies, it's on the other side of a really really steep hill. She can transfer between buses (an hour), take a bus and walk (at least an hour), ride a bike (40 minutes uphill), take a taxi (15 minutes, but the school won't pay for her to do this each way every day), carpool with other teachers (which may require her to get to school an hour and a half earlier than necessary), or hike 45 minutes over the mountain. None of them are very appealing options, and we haven't even really looked into her options to Yusung, her other, all girls high school, which is even farther away. It's been a source of stress for us so far, but Lisa's handling it really well, going with the flow as much as possible. We asked our co-teachers about finding housing closer to either of her schools but they said it is very difficult to find, and the houses are very old. I have a feeling that they believe our standards to be too high, though, so we're still working on it. Saturday afternoon someone came over to fix the internet connection, and he plugged and unplugged and unscrewed different things until he came to the conclusion, around 1:30pm, that he didn't have the right tools to fix it, so he had to run out. He told us he'd be back at 2pm. We were starving by this point, so we ran out to find a quick bite to eat in order to return before he did. There are several restaurants on our block, so we picked one at random. Turns out the place served the same multi-course-style meal we had eaten at the night before - not fast food by any stretch. I got up twice during the meal to run home and check on the internet guy, but luckily he was late and didn't come back until after we were through with our long, leisurely lunch. Oh By the way I forgot to mention I shall be arriving in Pohang on June 1st, 2012. So if anyone can help me in getting a room like this I will be really grateful to them. Hi Dr. Vijay, yes it is possible. 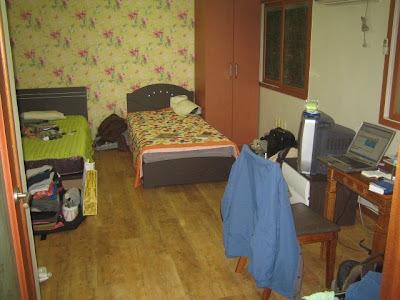 There are plenty of "one-rooms" and "two-rooms" around Pohang. 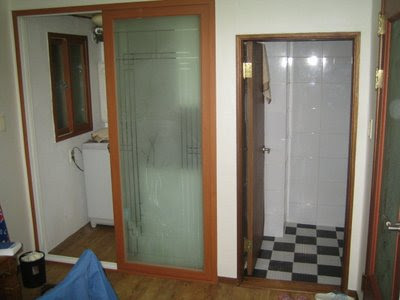 A one-room is a studio apartment, with just one small room and an attached bathroom. A two-room is a one-bedroom apartment, with a small living room, an attached bedroom, and a bathroom. You can find one for about 300,000 - 400,000 won per month, with up to 5 million won deposit (refundable). The higher your deposit, the lower the monthly rent should be. Any apartment you find in Pohang should have cooking facilities. does anyone know where we can find this kind of apartments on the web, for renting? Hmm, I do remember using a website to search for apartments some time ago, but I don't remember it now. I do know that one exists - does that help?